Too often, our “bad” debt spirals out of control, especially with credit cards and other forms of revolving debt reaching $25,000, $40,000, or even $75,000 with no way to pay them off. At that point, the minimum payments alone become a burden every month, and it would take decades to pay off at a ludicrous total cost. In fact, a record number of Americans have little or no savings, haven’t planned for retirement, and are living on a tightrope paycheck-to-paycheck, in large part because of their debt. For some consumers, when the situation becomes untenable, they turn to bankruptcy, the good news is that there may be a better option: debt settlement. Debt settlement is a viable financial tool for some consumers who are overwhelmed with debt and trying to stay afloat financially, but it certainly isn’t for everyone, as there are risks and nuances that must be understood first. In part one of this blog, we covered 5 things you need to know about debt negotiations and settlements. Today, we wanted to go over 5 more information points about debt settlement that are critical to understand. When it comes to money matters, debt, and credit scores, we often lose sight of the fact that it’s just business. Many of us become emotional, despondent, angry, and even depressed or fall ill, all due to the stress of managing our credit cards and debt. But it’s important to remember that, on the other side of the transaction, the banks, credit card companies, and lenders see it only as cold, calculated business. In fact, you are probably just a series of numbers to them, listed on a massive ledger of millions of other customers. Of course, you should value your ethics, morals, and be true to your word when you enter into any agreement, but it’s also healthy to take a step back and realize that it is just business. Our banks, financial institutions, and even our real estate developer-turned-President continuously negotiate, renegotiate, and settle virtually every debt they’ve ever taken on. This is one facet of debt settlement that’s so important to understand. A debt settlement is a mutually-agreed upon arrangement where your credit card company or lender accepts far less than what’s owed and writes-off the remainder of the debt. Why would they do so? #2 The main reason why a debt settlement will be successful is that you’ll (almost always) be late on your payments as you negotiate and reach a settlement amount. Of course, we never TELL clients to miss a payment for any reason, but most of the clients in our debt settlement program are at the crossroads where they realize they can’t keep paying every month or keep up with their debts. So, the real leverage you have with your banks or credit card companies is if you’re missing/missed payments. Only then they’ll take your request seriously (and literally move your file over to their Recovery Department which is authorized to negotiate and approve settlements). If you’re not late, you probably won’t get much of a settlement if at all – although some exceptions apply with certain lenders and types of debt. Just ask us! These days, U.S. consumers have plenty of credit card debt. Currently, we have $1.058 TRILLION in credit card debt, floating around among 128 million people, averaging out to $8,292 per household. 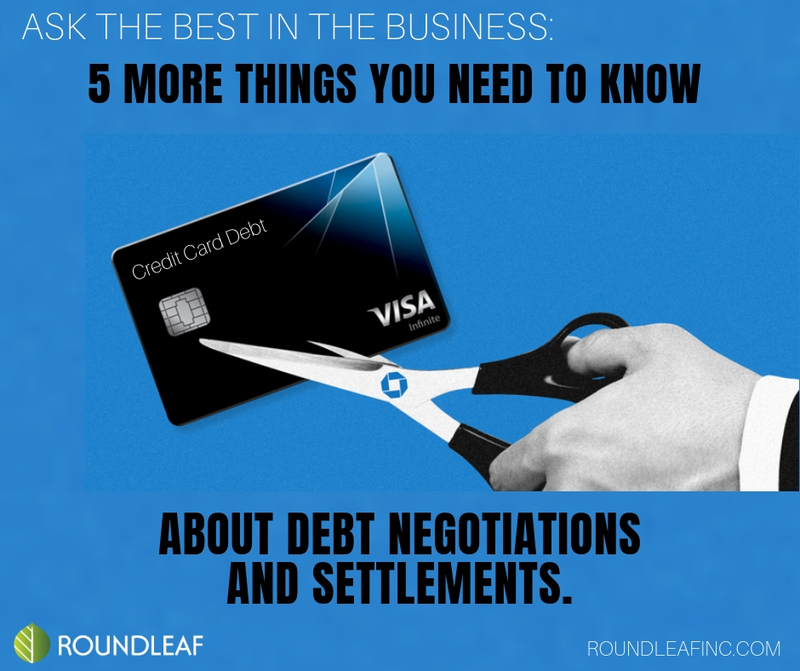 Roundleaf Inc. is the industry leader in safe and effective negotiations and settlements with credit card debt, and the vast majority of our clients come to use with alarmingly-high credit card balances that need to be settled! However, it’s not uncommon that we negotiate and settle other forms of debt. In reality, all revolving and unsecured debt can be negotiated and settled, although results vary. Medical debt is one of the fastest growing types of debt in America, and consumers walk into our office with some seriously hefty balances from surgeries, treatment or hospital stays that we negotiate. Just about any type of collections can be negotiated and settled, and other personal loans, unsecured bank loans, business loans, auto loan balances in arrears, etc. may be eligible, as well as some mortgage HELOCS or second loans. Unfortunately, mortgages and student loans are not good candidates for debt settlements, and there could be some severe implications to defaulting on those. It’s important that we discuss this, so you go into any debt settlement with clarity. A debt settlement won’t necessarily hurt your credit score (other than a slight adjustment based on closing an account or altering credit utilization ratios, etc.). But the vast majority who are in a debt settlement program and reach an effective solution do so because they’re missing payments (see above). Defaulting on any debt will negatively impact your credit score, and going 30, 60, or 90 days late will definitely ding your score. However, the credits core drop usually slows down (doesn’t stop) once that debt goes to collections (90+ days past due). The reality is also that if you were maxed out on your credit cards or loans and having difficulty making payments already, a debt settlement may be a useful tool to help you avoid missing payments in the future, anyways, or even falling into insolvency when you have to declare bankruptcy (which is REALLY bad on your credit). Remember that your credit score is important, but the numbers in your bank account and on your monthly budget are far more important. Once you’ve racked up a large sum of debt and have no means to pay it off, the best case scenario is that you negotiate and settle that debt and THEN we can help you rebuild your credit score in short order – but this time, with low or no debt! When it comes to debt negotiations and settlements, be careful who you trust! After reading our list of things you need to know about debt settlements (including part one of this blog,) it may seem like settlements can get relatively complex and that there are a lot of “moving parts” involved. It’s also why you shouldn’t trust just anyone to handle your debt negotiation and settlement. Unfortunately, the industry is rife with semi-legitimate companies who promise desperate consumers the world, but then rarely deliver. Of course, they make big fees in the process but leave a wake of disgruntled clients who may even be in a worse financial position. If any debt settlement company promises you a certain percentage or dollar amount for a debt settlement, doesn’t fully disclose the risks and downsides, or try to charge you significant fees before doing any work or producing results, run away! At Roundleaf Inc., we’re dedicated to handling debt negotiations and settlements the RIGHT way, based on legal expertise, relationships with credit card companies and banks, and a whole lot of hard work and experience – resulting in an entire book of testimonials from ecstatic (and debt-free!) clients. But before we can approve you for our debt settlement program, we’d like to make sure you have the proper education about all of your options with debt and make a clear and wise decision. Please contact Roundleaf Inc. if you have further questions or have significant debt and are looking for a safe and effective way out.